Air filter performance is measured by dust holding capacity and efficiency. Greater dust holding capacity means longer service life and lower operating costs. Greater efficiency means cleaner air and reduced maintenance costs. The Smith Dura Pak filters (Bag Filters) excel in both of these performance characteristics. We have MERV 14, MERV 13, MERV 11, and MERV 9 available in both Synthetic and Fiberglass. The Smith Dura-Pak (Bag Filter) is an extended surface high capacity air filter consisting of multiple sewn pockets supported by a corrosion resistant galvanized header frame. The filter is completely self-supporting and ready for installation. The Smith Dura-Pak air filters operate independent of outside power sources and have no mechanical parts. They are, therefore, operating whenever the air system is on. Bag filters are designed for use in areas that demand the highest degree of air cleanliness including hospitals, schools, industrial facilities and office complexes. The header consists of a rust-resistant all galvanized steel unit, designed to assure maximum strength and a positive seal. Individual pocket separators are also all galvanized steel. 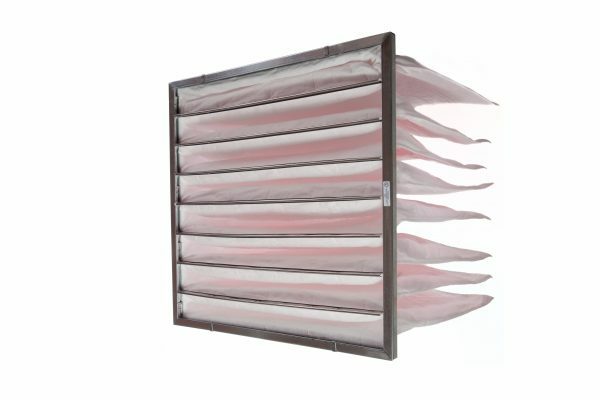 These add to the filters strength as well as directing air evenly into each pocket. The pockets are constructed of a high-efficiency synthetic media. It is sewn with an expanded stitch to maintain accurate media spacing. Each stitch is sealed with a hot melt sealant. The edges of each pocket are sealed with an overlock stitch for extra durability. All Smith Dura-Pak filters are produced from certified air filter media. For ease in identifying the level of efficiency being purchased, a color coding system is used. When requesting a quote for bag filters, We need to know your desired efficiency and # of pockets. You can also add loops to your order.